Exotic, beautiful and exhilarating, our Costa Rica multisport bike tour features tropical rides with exciting stops along the way. You'll begin your week with a rafting trip down the incredible Rio Balsa. As the week goes on you will discover the ancient secrets of chocolate on a rainforest chocolate tour, enjoy a boat cruise across Lake Arenal, hike and zip line through the Cloud Forest, take a surfing lesson and watch a Pacific Ocean sunset from the back of a horse. All this in addition to a variety of rides that get you up close to the Costa Rican countryside. Join us for an unforgettable week in one of the most diverse and picturesque places on earth. There is no way that one could individually organize that trip on their own. All the activities, travel, and logistics required to pull them off was massive, and in the end it seemed to proceed seamlessly. Your Trek Travel guides will meet you at the Hampton Inn & Suites at 8:45 AM on the first day of the trip. You’ll transfer one and a half hours to Bajo Rodriguez where, once at the river, you’ll meet your unforgettable raft guides, who’ll show you the ropes of rafting before putting on the water. Please have your rafting day bag easily accessible, separate from your luggage (non-cotton clothing and water shoes that will stay on your feet); you will have the opportunity to change into your rafting clothes once you arrive at the put-in. There are no dull moments today, as you will experience an exciting variety of Class II and Class III rapids in 9.5 miles as you pass through a tropical wilderness on a river fed by waters flowing from the Poás Volcano. There will be stops along the way to swim in the river's calmer sections. Afterwards, you’ll enjoy an authentic Costa Rican lunch at a local organic farm, where your raft guides become your farm guides and show you what ecotourism means to them. After this exhilarating adventure you will take a final brief shuttle to your hotel, where you can relax in the pool or jacuzzi while taking in stunning views of the Arenal Volcano (please note that the Alternate Property used on the March 15th departure, Brisas Arenal, does not have a pool or jacuzzi ). Reconvene with your companions for a social hour and dinner as your guides fill you in on the details of the adventures to follow. After breakfast, your Trek Travel guides will fit you to your bike for the week and describe what to expect on today's ride. Then you’ll hop on the bikes and ride to the small pueblo of Sonafluca, crossing over a few beautiful rivers along the way, while Arenal Volcano looms behind you. After the bike ride, you will have time to shower and change before checking out of the hotel. A visit to Rainforest Chocolate is up next, where you’ll take part in a tour to learn about the origin and history of the cacao tree, from the harvesting of the fruit to the drying and grinding of the seed. You will discover the ancient secrets of chocolate and of course, enjoy high-quality organic chocolate followed by a picnic lunch provided by your Trek Travel guides. Then, after a brief shuttle, you will board a private boat and cruise across beautiful Lake Arenal toward your next hotel, nestled high in the Monteverde Cloud Forest (a two hour shuttle follows the boat ride- this shuttle is on winding dirt roads into the mountains). Tonight, you'll savor a special dinner at the hotel, admiring views of the distant Gulf of Nicoya from the deck of the Celajes Restaurant. The sky is the limit today, as you begin your morning with a guided natural history hike in the Monteverde Cloud Forest Biological Reserve. Learn what makes Costa Rica one of the most biologically diverse countries on earth as a local guide leads the way through this unique ecosystem. After the hike, reset and refuel at a lunch spot of your choosing in downtown Santa Elena and take a little time to explore this small mountain town. Then we’ll head on to an adrenaline-filled afternoon at one of Costa Rica's longest zip lines, through the beautiful canopy of the Santa Elena Cloud Forest Reserve. This world-famous area is 90% virgin forest. After your zip lining adventure, you’ll shuttle back to the hotel, which offers a complimentary yoga class mid-afternoon to guests of the hotel. Tonight, you may dine at your leisure at the hotel in the Celajes Restaurant (the dinner is included in the price of your trip, but you are free to eat at the time of your choosing). For this portion of the trip it is advisable to pack long pants and rain jacket for the daytime activities and a sweater or jacket for the evenings, as the temperatures can be quite cool in the evenings and the weather is often intermittently rainy. After another truly memorable Costa Rican breakfast on the terrace of Hotel Belmar, your destination today is the Pacific coast. The day begins with a 3.5-hour shuttle down from the mountains into the warmer, dryer Guanacaste Peninsula (this shuttle begins and ends on dirt roads, with a bit less than half of the drive on paved roads). The shuttle ends at your next hotel, The Gardens, where we'll enjoy lunch on the open terrace and then change into cycling gear. From Playa Guiones you can pedal north along the coast past small communities along a rural dirt road to Playa Ostional, a protected black-sand beach known around the world for it's nesting sea turtles. You'll then turn back south to Guiones, the vibrant beachside community of the Nosara area where you'll spend the next two nights. This evening is yours to explore and your guides will have some recommendations to help you choose the best spot to suit your tastebuds! Relax poolside over another fresh breakfast including "gallo pinto," or rice and beans--a Costa Rican breakfast staple which may be one of your favorites by now. Then it's time to head down to Playa Guiones for a surfing lesson at one of the most consistent and best 'beach breaks' a beginner could ask for. If surfing isn't up your alley, you can choose to sign up for a yoga class at one of Nosara's renowned studios (not included in the price of the trip), stroll along the beach, or simply lounge by the saltwater pool at our hotel. The day is yours to enjoy and explore how you would like. 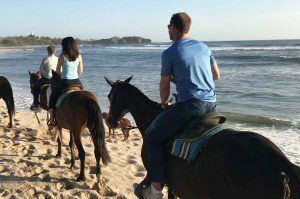 This afternoon you'll have the option to get back on the saddle - but this time on horseback - as our friends from Playa Ponies guide you through lush jungle trails and along the Nosara River as you head to your final destination, the pristine beach of Playa Pelada. Here, you'll admire the sunset while celebrating the last night of your Costa Rican adventure at La Luna, the best beachfront restaurant in town. As the sun sets on the Pacific Coast in Playa Pelada, the patio at La Luna begins to fill up. People from all over come to watch the gorgeous colors of sunset fall over the waves as they enjoy craft cocktails made with freshly squeezed fruit juices out on the beachfront lounge. With palm trees silhouetted in deep tones of orange and red, the sounds of the sea close by, and the airy outdoor ambiance, it’s easy to understand why La Luna is the most popular restaurant in the area. An appetizer of ceviche from today’s catch or a savory slice of flatbread topped with marinated olives and balsamic glaze solidify the restaurant’s offerings as some of the best cuisine around. Thin-crust pizzas, Mediterranean-inspired dishes, and of course the freshest seafood make up the award-winning menu, which is personally curated by the owner, Angelina. As the moon begins to rise above, you won’t want your dinner to end. Buen provecho! You will say farewell to your guides at 7:00 AM at The Gardens Hotel. From here, you may extend your stay in the Nosara area or return to San José via flight or shuttle. Trek Travel will provide one shuttle to the Nosara Airport, arriving around 7:15 AM or you can take our shuttle all the way back to Alajuela/San José. This shuttle can take from 4 to 6 hours. Sansa is an in-country airline that offers daily flights from the Nosara Airport to San José, departing at 8:00am and 5:00pm. Visit www.flysansa.com for more details and to book your flight. Book far in advance as flights sell out and be sure to check the baggage restrictions. If you chose to take the Trek Travel shuttle back to Alajuela, we strongly suggest spending the night near the airport and booking a flight for the following morning. It is very risky to book an evening flight from San José, as traffic and road conditions on the drive back from Nosara are unpredictable. What happens when comfort and relaxation combine with natural beauty and global consciousness? Welcome to a hotel with a higher calling. Casa Luna is an ecological marvel, committed to protecting Mother Nature while providing outstanding amenities. Located at the foot of Cerro Chato, an inactive volcano, the hotel was constructed with reforested wood, contaminate-free paint, roofs of recycled plastic and an energy saving electrical system, which minimizes the footprint without sacrificing comfort. Gardens surround the grounds, and rooms typically include terraces with exquisite views. Located in Costa Rica’s lush Cloud Forest amid the mountaintops of the Monteverde Reserve, Hotel Belmar offers guests a truly unique experience rich in natural wonder and elegance. Surrounding the two charming chalets that compose the hotel you will find naturally landscaped gardens with luscious native plants, a vegetable and herb garden and a beautiful swan lake complete with sun deck. By day you can rest tired muscles at the hot tub or loosen up in the yoga studio, and by night you can take in expansive views of the sunset over the distant waters of the Gulf of Nicoya from the hotel bar. Perched in the Cloud Forest but enjoying views of the Gulf on the horizon, the Hotel Belmar is situated in a truly privileged location. This recently renovated property is located just a 5 minute walk from the world-class surfing of Playa Guiones as well as the restaurants, shops and yoga studios that make this community a highly sought-after (yet off the beaten path) destination. Enjoy farm to table dining in the on-site organic restaurant, El Local; swim in the saltwater lap pool; have a beer at the on-site beer garden or simply relax in a hammock in the gardens. This beautiful property offers a place of retreat or a jumping off point to explore all that Nosara has to offer, all while maintaining high standards of sustainability. Brisas Arenal is a boutique hotel located just outside the town of La Fortuna. The property includes a small reserve of forest that is set aside for conservation, and here guests can observe native plant and animal species. This is a small, family-owned property with a strong commitment to sustainable tourism and customer service. You will stay here in place of the Casa Luna Hotel & Spa on a select 2020 date. The Living Hotel is located just a 3 minute walk from the world-famous Play Guiones and is centrally located to the restaurants, night life and yoga studios of this vibrant community. The hotel boasts a large saltwater swimming pool, a gorgeous rancho, lounge, comfy hammocks for napping, free wifi, daily yoga classes, and a restaurant/juice bar. You will stay here in place of The Gardens Hotel on a select 2020 date. Each offers something special and unique. Rest your head in a spacious room in the shadow of Arenal Volcano; a family-owned eco-friendly hotel on a mountaintop near the Monteverde Reserve; and a comfortable retreat in the heart of Guiones. Gratuities for your Trek Travel guides are not included in your trip price. We recommend tipping 7.5-10% of your trip price for the guide team. Local currency is preferred and unless you want to tip separately, guides will divide tips amongst themselves. Getting cash from ATMs can sometimes be a challenge in Costa Rica, so you may consider bringing along cash for this purpose, or using an alternative method such as PayPal or Venmo. Please tip your guides at your discretion, based on their level of professionalism, guest care and service. The terrain is mostly non-technical on rough dirt roads with some sections of pavement, with some steep grades. We will ride hardtail mountain bikes on this trip due to the nature of the riding. Although we will always be on roads, these roads sometimes have large potholes and some washboard surfaces that make mountain bikes the preferred method of travel. Costa Rica is best suited for our Type 2 Riders. Our Trek Travel guides can also easily accommodate Type 1 Riders, who seek less mileage or fewer uphills, with a boost in the support vehicle, although Type 1 riders may be intimidated by the rough nature of the roads and should consider this when booking the trip. We suggest that you arrive at least one day prior to the trip start, which will enable you to adjust to the time zone and minimize the risk of missing the trip start due to flight-related delays. We recommend that you fly into Juan Santamaria International Airport (SJO), which is located in the town of Alajuela. Taxis are readily available at the airport. Our meeting location, Hampton Inn & Suites, is just under a mile from the airport and offers a free 24-hour airport shuttle if you choose to stay there an evening. Alternatively, for those arriving early to explore, an hour-long taxi ride takes you to downtown San José and costs around $20 USD. Your Trek Travel guides will meet you at the Hampton Inn & Suites (Hwy 1 Airport Blvd, Alajuela, Costa Rica 1017) at 8:45 AM on the first day of the trip. You’ll transfer one and a half hours to Bajo Rodriguez where, once at the river, you’ll meet your unforgettable raft guides, who’ll show you the ropes of rafting before putting on the water. Please have your rafting day bag easily accessible, separate from your luggage (non-cotton clothing and water shoes that will stay on your feet); you will have the opportunity to change into your rafting clothes once you arrive at the put-in. If you will be late for the pick-up or are going to miss it altogether, please inform your guides. You will receive an email a week before the trip start with their names and contact details. If you cannot reach them, please call our first hotel, Casa Luna Hotel & Spa (506-2479-7368), and leave a message with your expected arrival time and contact details. "Pura Vida" or "the pure life" is an existential characteristic of Costa Rican culture, and it's alive and well at this charming hotel. Here, nothing gets between you and the relaxation you crave. Once a coffee plantation, this hotel is now in a lush tropical garden, surrounded by coffee and sugarcane plantations. Enjoy breakfast in the Orchid Restaurant where fresh foods from the nearby market are proudly served by your hosts. Spanish Colonial charm combines with tropical beauty at Hotel Buena Vista. At 4,200 feet in elevation, it's the only resort that sits atop a mountain and offers 360-degree views of lush tropical forests, coffee plantations, three volcanoes and the city below. When you're done soaking in the views, relax in the heated pool and have a drink at the poolside bar. At this remarkable resort, 24 individually designed villas on a 40-acre plantation overlook the Central Valley. The restaurant serves fruit and vegetables from their organic greenhouse, orchard, and gardens. The resort also features a spa with open air treatment spaces with views of the valley. This recently renovated property is located just a 5 minute walk from the world-class surfing of Playa Guiones as well as the restaurants, shops and yoga studios that make this community a highly sought-after (yet off the beaten path) destination. Enjoy farm to table dining in the on-site organic restaurant, El Local; swim in the saltwater lap pool; have a beer at the on-site beer garden or simply relax in a hammock in the gardens. This beautiful property offers a place of retreat or a jumping off point to explore all that Nosara has to offer, all while maintaining high standards of sustainability. This is also the hotel where you will stay the last 2 nights of your Trek Travel vacation. Contact the hotel directly to inquire about extending your stay. You’d expect a hotel started by a couple of surfers to be steps from a pristine surf break on Playa Guiones. But what you don’t expect is that this glorious, hidden gem - with its hummingbirds and howler monkeys - is committed to sustainability, energy efficiency, and keeping the tropical paradise that surrounds it as perfect as possible. The accommodations have it all, with well-appointed rooms and health-conscious amenities like yoga, a spa and juice bar. But it’s also got ecology in its bones. You’ll feel it the moment you set foot inside. Surf’s up. And so will be your spirits. This beautiful and relaxing property is another great option for anyone wishing to extend their stay in the Nosara area. These simple yet stylish rooms surround the pool in an inner courtyard. Accommodation options range from King or 2-Queen bedded rooms with their own private courtyard to shared space in The Bunk Room, for those looking for an economical but well-appointed option.